Scholar of the seventeenth century; rabbi of Venice, Sassuolo, and Mantua. He was the author of the "Perush 'al ha-Ketubah," a work on marriage settlements. A commentary on this, entitled "Sheṭar Bi'urim," was in the possession of Joseph Almanzi. Abraham wrote also the "Sefer Zera' Abraham," on rituals, and a responsum included in the "Debar Shemuel" of Samuel Aboab (No. 19). Rabbi of Ferrara in the sixteenth century. He was the author of "Tiḳḳunim" (or "Haggahot ha-RIF"), on Alfasi's commentary on the Talmud, and of a responsum included in the collection of Jehiel ben Azriel Trabot (No. 19). 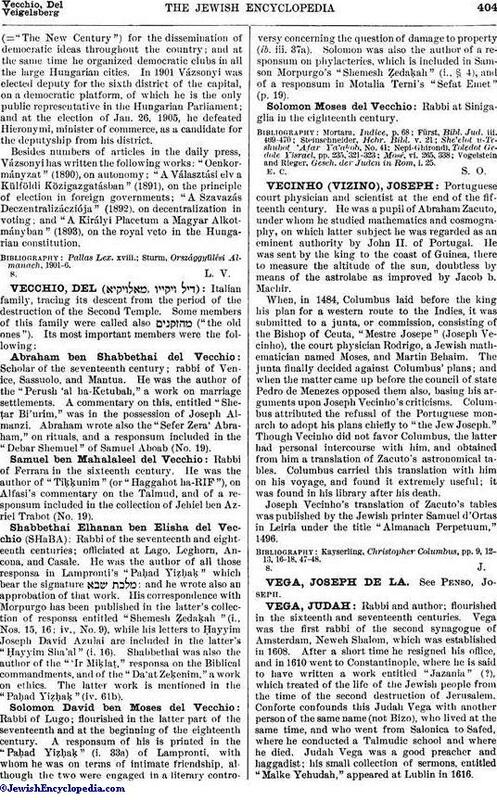 Rabbi of the seventeenth and eighteenth centuries; officiated at Lago, Leghorn, Ancona, and Casale. He was the author of all those responsa in Lampronti's "Paḥad Yiẓḥaḳ" which bear the signature ; and he wrote also an approbation of that work. His correspondence with Morpurgo has been published in the latter's collection of responsa entitled "Shemesh Ẓedaḳah" (i., Nos. 15, 16; iv., No. 9), while his letters to Ḥayyim Joseph David Azulai are included in the latter's "Ḥayyim Sha'al" (i. 16). Shabbethai was also the author of the "'Ir Miḳlaṭ," responsa on the Biblical commandments, and of the "Da'at Zeḳenim," a work on ethics. The latter work is mentioned in the "Paḥad Yiẓḥaḳ" (iv. 61b). Rabbi of Lugo; flourished in the latter part of the seventeenth and at the beginning of the eighteenth century. A responsum of his is printed in the "Paḥad Yiẓḥaḳ" (i. 33a) of Lampronti, with whom he was on terms of intimate friendship, although the two were engaged in a literary controversy concerning the question of damage to property (ib. iii. 37a). Solomon was also the author of a responsum on phylacteries, which is included in Samson Morpurgo's "Shemesh Ẓedaḳah" (i., § 4), and of a responsum in Motalia Terni's "Sefat Emet" (p. 19). Rabbi at Sinigaglia in the eighteenth century. Vogelstein and Rieger, Gesch. der Juden in Rom, i. 25.